About 10 days ago my life got picked up by the ankles and shaken vigorously. In a good way, but also in a totally life changing way... (no, I'm not pregnant, will everyone stop asking!). I'm not going to tell you what it is quite yet, but it will be really exciting if it all happens. This though has been in between a very busy work time, many important social commitments and a severe dose of the flu. So during this all, I've had very little time for serious food preparation. It's been about simple, sensible, comfort food, laced with some serious sweetie binges, which I blame completely on stress. However, there is one recipe I cooked which I would like to share with you. Now when I say it is a recipe for butternut soup, it may seem a bit of a let down. 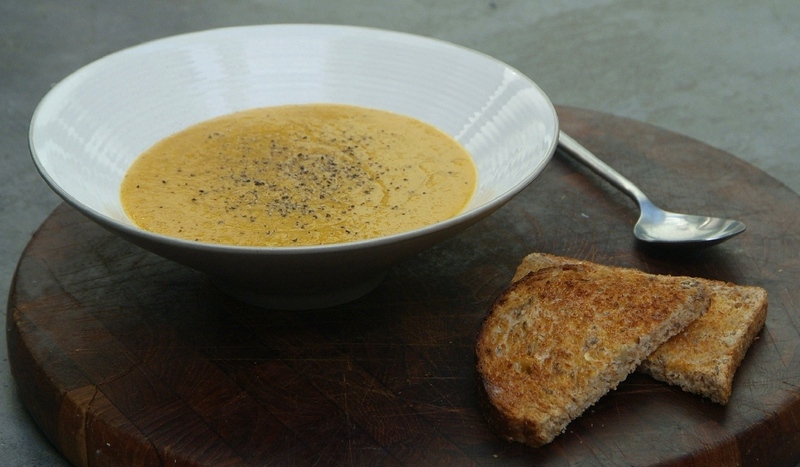 Hold back, not all butternut soup recipes are created equal. It may be a staple South African winter recipe and right next bolognaise in terms of an entry level repertoire. But this one stood out to me because it was so very very simple, subtly different from the norm and totally delicious. Adam's cousin made it for us and I just had to have the recipe. I remade it and it was just as delicious. Now I insist on sharing it with you all! In a medium to large pot, fry the onion, garlic and ginger in the oil until soft but not browning. Add the spices and fry for 30 seconds or so, to release the flavours. Add the coconut milk and water and stir to combine all the flavours. Add the chopped potato and butternut and cook until tender. Once tender, add the butterbeans and puree in the pot until smooth with a hand blender (or in a food processor if you don’t have one). Season with salt to taste.